Transportation entails various impacts on biodiversity, the most prominent being barrier effects, noise and visual disturbances, traffic mortality, habitats lost, but also new habitats created, and invasion of alien species. Transportation authorities are key actors in managing these impacts, and in optimizing biodiversity values related to transportation. But the impacts are extensive and complex, and at least for Sweden, the research conducted so far has not provided an overall perspective of impacts of roads and railroads on nature and biodiversity. Accordingly, research has not firmly pointed out what questions that are most crucial or need urgent attention. As a consequence, mitigation of negative impacts lags behind in relation to what should or could be done, and the efforts conducted does not reach their full potential. 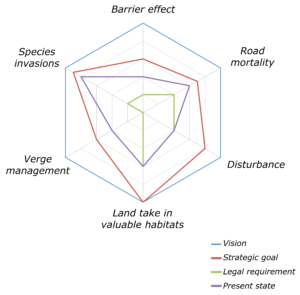 In order to overcome this situation, we developed a conceptual model of the impacts of transport infrastructure on biodiversity, that could help getting the necessary overview of the field. The model structures the complex impacts into comprehensible pieces, and aims to identify the discrepancy between present state and desired state (be it vision, strategic goal or legal requirement) for each type of impact. The model as a whole describes the ecological sustainability of the transport infrastructure in a glance – a simplified illustration necessary for communicating the matter with decision makers or the general public. We are well aware that the model can not cover the full array of impacts described in literature, but believe that we have found a reasonable trade-off between rigour and accessibility. The model visualized in a polar diagram, with draft examples of values on different axes. 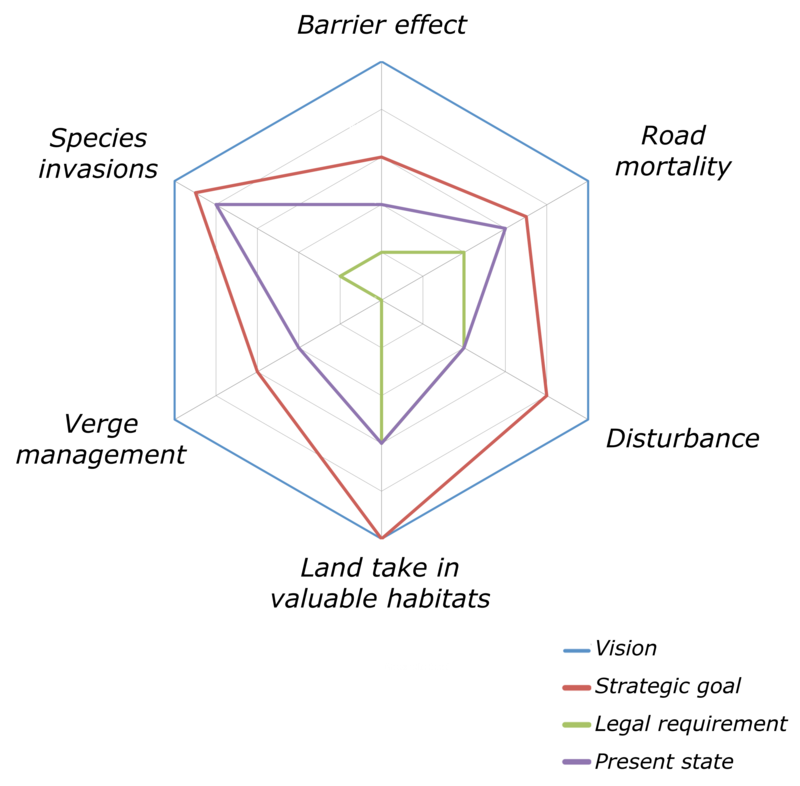 The model has in its first version proven effective as an aid for the Swedish Transport Administration (STA) to prioritize among nature conservation efforts and research. After selecting indicators for the impacts, the model can form the basis for a system to monitor the ecological performance of the transport infrastructure network. Last but not least, the model development per se has provided a forum for in-depth discussion among specialists from different fields; between scientists and practitioners, among disciplines within the STA, and between STA and other relevant sectors. The discussion is on its way to create a unified understanding of the complex impact of transport infrastructure on Swedish biodiversity. The project is completed and published in a Swedish report. The model was presented as a poster at the ICOET conference in Scottsdale, Arizona in 2013.